Again with the Disney stuff, I know! Yeah, yeah, I’m a broken record. But a busted clock is right twice a day, or something like that. Besides, our little customized vacation booklet (for our vacation in six months’ time; Disney are masters of the slow jam tease) arrived today and I’m getting ex-ci-ted! We made up a list this week of all of the food items/experiences we’d like to try on our next trip, and the somehow incomplete list is 46 items strong. And one of those I have listed as “Eat everything at Epcot Food & Wine.” So. Anyhow, these cherry blossom nails with not-so-hidden Mickeys are in celebration of the fact that I may be able to stop griping about the other thing I’m always banging on about, and that’s the crap weather we have been, um, enjoying this protracted winter. Because with temperatures predicted to be in the mid-teens this weekend, it looks like spring might actually be here to stay. So cherry blossom season, just ever so slightly delayed. As always, my mani’s got me thinking about Disney. I think this is the part where I’m supposed to say I want to be there RIGHT NOW, but I so don’t want to be there right now – right now is spring break, and spring break at Disney occupies its very own circle of Hell. I saw photos yesterday of the lineup for Space Mountain that just about gave me a panic attack – it extended all the way out of the attraction and down to Auntie Gravity’s. For those perhaps not as well versed in the Magic Kingdom’s geography as I, that’s a gigantic, four-plus hour lineup, easy. Ugh, what a nightmare. I’ll take this simple, springy mani over that any day, thank you, but especially on my birthday! Ain’t nobody got time for that nonsense. And as has been my little tradition now two years running, I blew out a candle and made a birthday wish on a decorated wax sheet cake from Sniff My Tarts. I don’t have much of a sweet tooth – plus there’s that whole sure-to-be-indulgent dinner thing coming up – so this custom cake (featuring a blend of Peppermint, Coconut Cream Pie and Sticky Marshmallow) really fits the birthday bill. So happy birthday to me, and happy birthday to you, too, should you also be celebrating on this Friday the 13th. To another great year! To paraphrase Ed Helms’ little tiger-centric ditty in The Hangover, what do unicorns dream of, when they take their little unicorn snooze? Do they dream of impaling idiots in expensive Etsy unicorn headbands, or even bigger idiots at Coachella in some holographic catsuits? Okay, so I think the whole unicorn thing is a little played out. I particularly dislike any of the numerous indie bath and beauty products named after any bodily function or fluid of a unicorn. Seriously, that’s so gross, stop giving your products such off-putting names. Still, slight diatribe aside, it’s the best descriptor I have for this polish, Liquid Sky Lacquer’s Dream – unicorn-y. Just look at that rainbow flare! And the tiny blue flakes and the micro shimmer, and the almost neon-looking holographic effect, too. 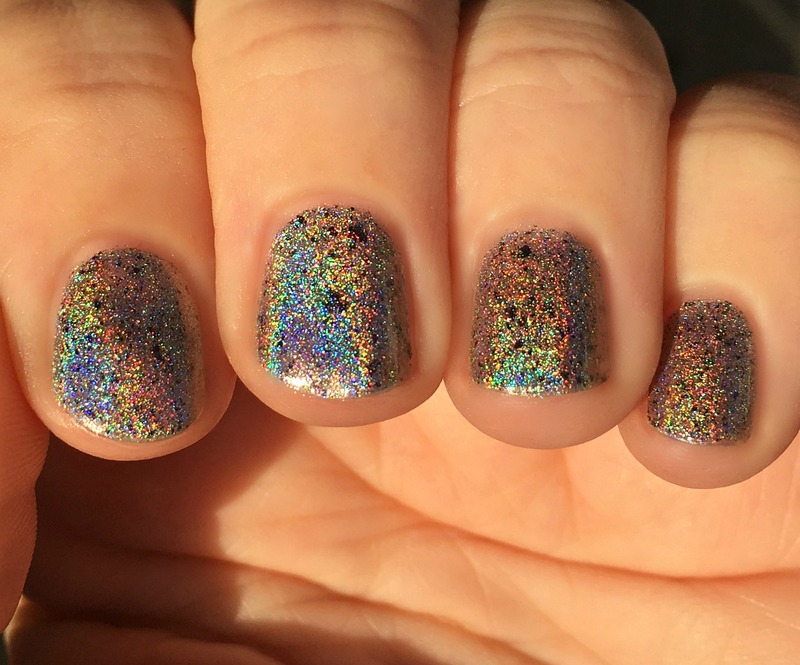 I love this polish so much, and I just had to dig it out of “Why don’t I wear this more often?” storage yesterday to take advantage of the dazzlingly bright sun and clear blue skies. Because this was the weather we were experiencing here about a day and a half ago – total whiteout. You know, just your standard, bitchingly lame springtime blizzard. As you do.